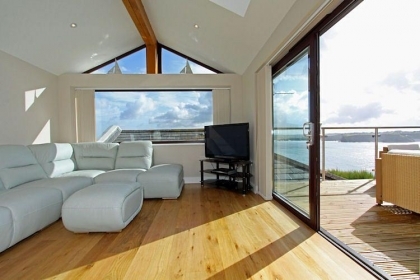 This beach house in Newquay sleeps 6 in 3 bedrooms and enjoys fabulous sea views. The holiday home offers Wi-Fi access, is pet friendly and has off street parking for 2 cars. The house is only a few minutes walk to Fistral Beach, Newquay’s harbour and the town centre. Inside this beach house offers light and airy living spaces with lots of natural light and contemporary furnishings. Outside, the house has a large terraced balcony which is furnished with comfortable sofas and chairs. Here is the best place to enjoy the panoramic sea views after a day on the beach. Newquay town centre is just minutes away where you will find a bustling town full of shops, cafes and restaurants. Newquay also offers plenty of family attractions including Newquay Zoo and The Blue Reef Aquarium which make for great days out.